Apparently I can't start a blog post without a picture to hang it from. 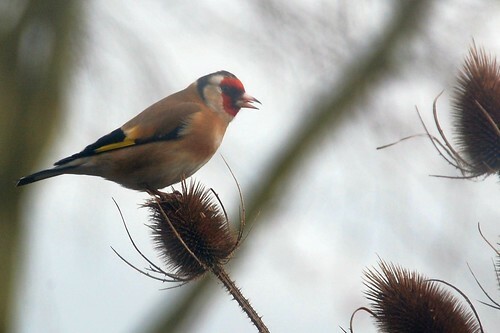 Luckily a couple of days ago a small flock of goldfinches descended on the teasels. This picture was taken through the kitchen window as they cleaned the seedheads of all remaining accessible morsels. It seems the old trouble, the one that stops me writing, has stopped me painting or doing anything much has spread and just at the moment I feel frozen and unable to get started on the seed planting which is normally such a boost to my mood each spring. I'm casting around in my head looking for a strategy or trick that will break through the jam and let something approaching normality emerge. At least with the sun shining today brings a little more optimism in my day and I certainly have lots of new seeds that have the potential to be inspiring if I can only get them into the soil. I found an unnamed variety of Rocoto for sale at Magic Garden seeds and some Conopodium majus (pignuts in the UK) which I'm sure I have already growing wild but have been so unable to accurately identify the plants that I thought starting some from named seed would be a good exercise before attempting to forage again. The seeds look similar to another related plant sometimes grown for its edible roots but checking on this useful botanical picture I think these are what I'm looking for. And I have some more ramson seeds which I hope will be more successful now that I understand they germinate best after stratifying - previous attempts have failed miserably. A couple of the ulluco tubers sent to me by William Whitson at Cultivariable Seeds have been potted and sprouted already. I started them as an insurance but space indoors is extremely limited so the rest must wait until better weather allows them to be started in the cold greenhouse. Best get planting then while the suns shines. It is a beautiful day. And while I'm stuck inside working it would be wonderful to have a bit of free time in the garden to enjoy the lovely sun. :) I'm sure your flowers will bloom in due time as lovely as ever.